Offering you a complete choice of products which include Wall Paint, Interior Wall Paint, Tractor Emulsion Paint, Tractor Acrylic Distemper Wall Paint, Tractor Synthetic Distemper and Distemper Wall Paint. We are prominent brand as a leading supplier of wide spectrum of Wall Paint in the market. The offered paint is highly admired by our valuable clients for its different qualitative attributes. Under the surveillance of our vendor's workforce, this paint is immensely processed using premium quality chemical compounds and innovative techniques. This paint is strictly tested on various parameters to ensure its optimum quality as per the defined industry norms. We are the renowned firm, indulged in offering our clients quality approved Interior Wall Paint. The offered paint is processed using the best quality chemical compounds and sophisticated techniques under the guidance of our vendor's deft professionals. Our provided paint is used for coating indoor surface. We offer this paint in various colors as per the preferences of our valued clients. This paint is available in safe packaging options at a pocket friendly price. Owing to the qualified team of professionals and advanced infrastructural unit, we are providing a vast assortment of Tractor Emulsion Paint. The provided paint is widely used for wall painting. Our offered paint is acclaimed by our prestigious clients for its long shelf life and balanced composition. Besides this, this paint is processed under the vigilance of our vendor's adept professionals using quality assured chemical compounds and pioneered techniques. Driven by technical excellence, we are counted as the topmost supplier of Tractor Acrylic Distemper Wall Paint. This paint is well processed using superior grade chemical compound and cutting-edge techniques according to the guidelines of the industry specifications at our vendor's end. Offered paint is offered in various colors and is demanded for its accurate composition. 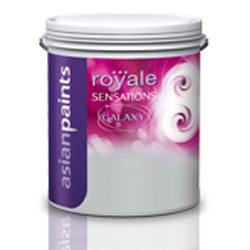 Our provided paint can be availed in various packaging options with in committed time frame at the best price.